Alastair Seeley has broken the record for wins at the North West 200 road races by achieving his 16th career win at the international meeting. The 36-year-old from Carrickfergus had been level on 15 with the late Robert Dunlop going into Thursday's races. Seeley broke away to win the opening Supersport race ahead of runner-up Ian Hutchinson and Martin Jessopp. The Supertwins race was abandoned after a two riders were injured in a high-speed crash. Dungannon rider Ryan Farquhar and Dan Cooper from Stroud came off at Black Hill and were taken to hospital. 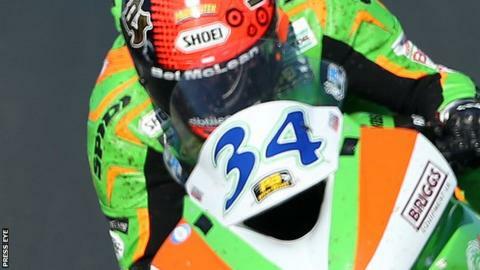 Forty-year-old Farquhar sustained chest and pelvic injuries, while Cooper, 28, had shoulder injuries. Record-breaker Seeley has won at least one event at the North-West for nine years in a row. He has also won at least one Supersport race in each of seven consecutive years from 2010 to 2016. The Supersport event provided a thrilling start to racing at the 2016 North West. Ballymoney's Michael Dunlop, a four-time winner at the North West, did not make it off the grid because of mechanical problems. Seeley surged into an early lead but some exillerating action saw Fermanagh rider Lee Johnston, Yorkshire man Hutchinson and Michael's brother William Dunlop all take turns at the front. Seeley, Hutchinson and Jessopp all broke the class lap record on the final circuit. "The North West put me on the map when I first came here and now to be mentioned in the same sentence as the Dunlops is unbelievable," said an elated Seeley. "It was a typical Supersport race. We managed to get a break and clinch the 16th win."